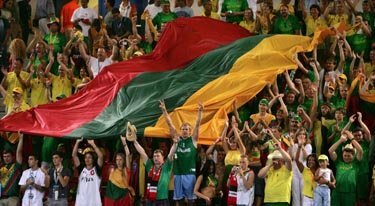 Lithuania won 3 medals in the Athens Olympics - 1 Gold and 2 Silver. Virgilijus Alekna won Gold in Discus Throwing; Austra Skujytė won Silver in Heptathlon (100m hurdles, high jump, shot put, 200m race, long jump, javelin throw & 800m race); and Andrejus Zadneprovskis won Silver in Modern Pentathlon (shooting, fencing, swimming, riding & running). Although America came out tops in the medal tally, with 103 medals including 35 gold (followed by China, Russia, Australia and Japan), it might be of interest to note that the EU with its 25 member states, won 286 medals, including 82 gold. In Athens 2004, Lithuania had representatives in a wide variety of events, including athletics, pentathlon, heptathlon, walking, running, marathon, basketball, boxing, flat-water kayaking, cycling, rowing, sailing, shooting, swimming, weightlifting and wrestling. 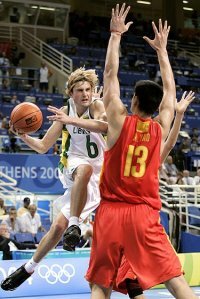 Highlights were the Men’s basketball team, as the Lithuanians won every match in the preliminaries, including beating the US, before going on to lose the semi-final to Italy and the Bronze match to the US - which was a blessing in disguise to the Lithuanian government, as it ended up saving in total over Aust $2 million, which they had promised to medal winners. After 3-point gunner Šarūnas Jasikevičius scored 28 points beating the US 94-90, he was asked why he hasn’t been snatched up by NBA scouts (America’s National Basketball Association). Šarūnas said it’s because he’s a slow, fat white guy and the international scouts, who come to see him, don’t have much pull. He speaks pretty good English, having attended the University of Maryland. Back in Lithuania, fireworks thundered above Vilnius and other towns, as cheering crowds filled the streets, singing and waving flags in anticipation of what could be. There were reports of Greek, Argentinean and Lithuanian fans booing the USA, but that’s not really true, as there were also Americans booing their own team every time they played a lousy shot. It didn’t help when USA players left the court without shaking hands with the Argentinean winners, but neither did the Lithuanians when they lost to the Italians. How do you shake hands with opponents who are deliriously piled up on top of each other in centre court? The women’s cycling was pretty impressive, with Simona Krupeckaitė looking like she was going to win a medal in the 500m cycle track, when China scored a world record, only then to be beaten by Australia who beat China’s record, leaving Simona in 4th place. She also cycled to 7th place in the women’s sprint finals. Rasa Polikevičiutė and Edita Pučinskaitė finished in the midway mark in the Women’s Road Race and Edita came 10th in the 4km women’s individual cycle race. In the Women’s Marathon, Lithuania had runners at both ends - Živilė Balčiūnaitė finished 14th and Inga Juodeškienė was 63rd. Mindaugas Pukstas in the Men’s Marathon didn’t do as well, coming 74th out of 102. 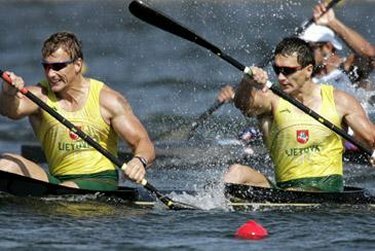 In the 500m kayaking pairs, Alvydas Duonėla and Egidijus Balčiūnas were 1st in the semifinals and ended up 7th in the finals. Shooting had hundreds of competitors and Daina Gudžinevičiute ended up 14th. We didn’t do so badly in boxing either: Jaroslavas Jakšto reached 5th place in the +91 kg. Heavyweight lifter from Klaipeda, Ramunas Vyšniauskas, lifted 187.5 kg and 225.5 kg, reaching 6th place. He said afterwards, that if he would have lifted as much as he did back in Lithuania, he would now be the Olympic vice-champion - but it is, as it is! One of the Lithuanian competitors, Raimondas Turla, who competed in the 200 and 400 metres, was also a candidate in the October 10 Lithuanian Parliamentary elections. Gold winner Virgilijus Alekna is the world champion in discus throwing. He threw 229’ 3" in Athens and was also No. 1 in Sydney 2000, the 2004 Golden League, the 2003 World Championships, the 2003 World Athletic Final and the 2001 Grand Prix. He is a Physical Education teacher by profession and was Track & Field News’ Athlete of the Year in 2000. He is a holder of Lithuania’s state award - the Gediminas order. Silver Heptathlon winner, Austra Skujytė is a 6’2" tall student, who spends half her time studying in the US and half her time in Lithuania. She has been a scholarship holder with the Olympic Solidarity program since August 2002. She’s competed in World Heptathlon and Pentathlon championships. Her funniest moment in athletics was at the 2000 World Indoor Championships, when she crossed the finishing line of the 800m on all fours! Andrejus Zadneprovskis, the Pentathlon Silver winner, was born in Kaliningrad. He started training in Lithuania at age 16, supported by his pentathlete father. Andrejus holds heaps of Medals at Olympic Games and World Championships and came 7th in Sydney in the Individual event. He is single, a lawyer, 5’9" tall and has a nickname Mažas (shortie). On their return home, Gold and Silver Medallists, Virgilijus Alekna & Austra Skujytė, were showered with flowers by fans at Vilnius Airport. Waiting to greet the champions were family, coaches, Prime Minister Algirdas Brazauskas, Vice President of Seimas (Parliament) Ceslovas Juršėnas and a full playing orchestra. The 32 year old Alekna and 25 year old Skujytė wore their Olympic wreaths and medals. In past years, the Olympics used to be a competition between amateurs for just the glory of winning. But in the 1980s, this ideal collapsed when it became obvious that many athletes were receiving large sums of money on the sly. So instead of enforcing the rules prohibiting payments, the IOC (International Olympic Committee) abolished the rule that forbade athletes to receive money, opening up the floodgates for huge sums of money to slosh around with everyone - from trainers, lackeys, hangers-on and the Mafia - wanting a cut of the athlete’s money. The Kazakh Olympic boxing champion Bekzat Sattarkhanov died in a mysterious car accident on New Year's Eve 2000, after winning Gold in the Sydney Games. It is speculated that he didn’t want to share his prize. It’s sad that the small and poorer countries tend to pay their athletes more than the larger wealthier countries. USA athletes get A$36,000 for gold while Russians get A$72,000 and Lithuanians A$180,000 plus a BMW from the Lithuanian Olympic Committee. Two-time gold winner, Virgilijus Alekna, said he gave his Sydney Gold Medal to his eldest son and said his Gold one from Athens he’ll give to the one that as yet doesn’t have one. But not all medal winners were as happy to part with their medals. Irina Korzhanenko of Russia, was stripped of her women's Olympic Shot Put Gold after testing positive for steroids. She’s been banned for life for refusing to hand back her medal - she gave it to her little brother! Hungarian hammer thrower, Adrian Annus, also lost his Gold for refusing to give a second sample. He refused to return his medal also, saying he considers himself the champion. 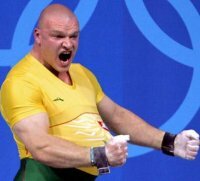 Weightlifter, Ferenc Gyurkovics also lost his Silver, making it three Hungarians who forfeited medals in Athens because of doping. In total, 28 athletes were banned in Athens for violating anti-doping rules. Two of Greece’s top sprinters were banned at the beginning of the Games, while another two Greek baseball players, a Kenyan boxer, a Swiss cyclist, a US 100 metre champion, a Spanish canoe team member and an Irish distance runner were among some of the other athletes who were expelled. Alekna had said his fiercest rival was Hungarian Robert Fazekas, who is also a world-class hammer thrower and shares a coach with the disgraced Annus. Fazekas had been a modest performer for most of his career until his breakthrough in 2002, when he won the European and World Cup titles. He was expelled from Athens and banned for two years after he was spotted by officials trying to tamper with his urine sample after the final. An official for the Hungarian Olympic Committee said that Fazekas was at the doping control until 3 am and he just could not give enough. He claimed Fazekas "...was a deeply religious person, who has always had difficulty to produce a sufficient quantity of urine in front of sample collectors." Give him a beer, somebody!